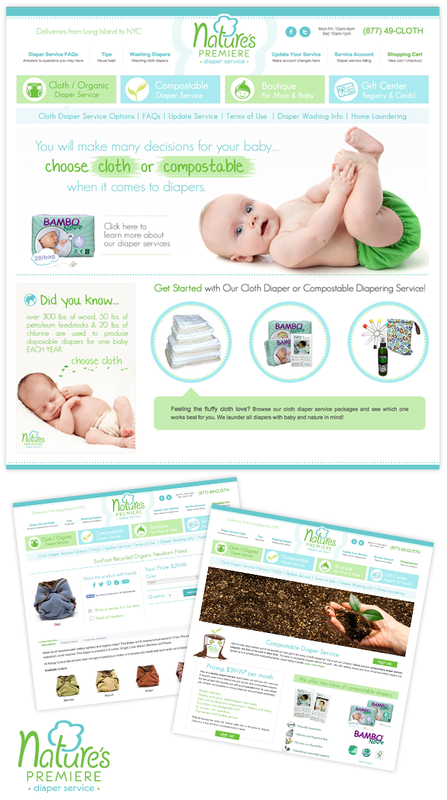 Over the past couple of months we’ve been working on a full redesign and update of scripts, forms and business angle for Nature’s Premiere Diaper Service. This client has been with us for the several years and receives regular maintenance by our staff. This redesign took the store from an online boutique focused business to a diaper service focused business. Still maintaining the boutique but not as the main feature of the site. The goal was to make things more easily accessible for the majority of their clients which are New York locals that use their diaper service. Along with the site redesign we also rebranded the company with a new logo / identity. Taking a company from a kiddish-cartoony look to a more soft, modern look. We’re very pleased with how everything turned out. A fresh new look on their existing 3dcart platform.